Carthage is one of those names from antiquity one hears again and again when looking at anything to do with the Romans, but I didn’t know where it was. This trip has served to flesh out my previously sketchy grasp of the ancient world – “all part of your education” my Dad would have said. 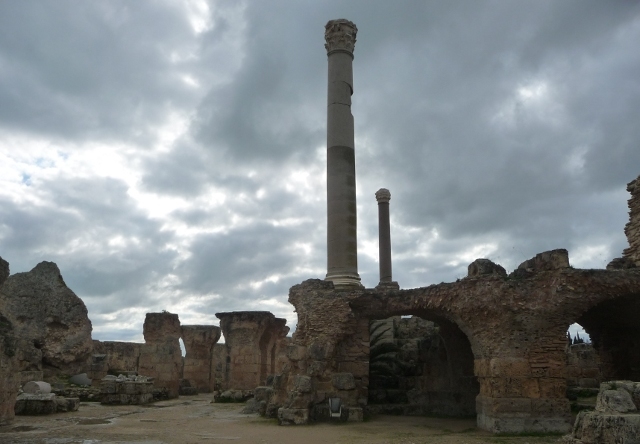 Carthage was in fact on the coast of Tunisia just north of present day Tunis. Founded by the Pheonicians (a seafaring trading peoples originally from around Lebanon who had a profound influence in the region) in 814 BC. It became one of the most significant port cities of the Mediterranean. Rome had its eyes on this strategic centre and captured and destroyed it during the Punic Wars (Punic describes the Pheonicians and their civilisation). They built their own fabulous city on the ruins, which was destroyed in turn by the Vandals in 439 AD who ruled in Tunisia for a while. The Byzantines of the Eastern Holy Roman Empire, based in what is now Istanbul, took Carthage in 533 AD. The Arabs then invaded in 647 (bringing Islam with them) making the nearby settlement of Tunis their city. Much of any riches and rubble remaining was carted off for reuse as building materials during the course of this turblulent history. There’s not much left of it now so would there be enough to go and see beyond the odd pile of stones? 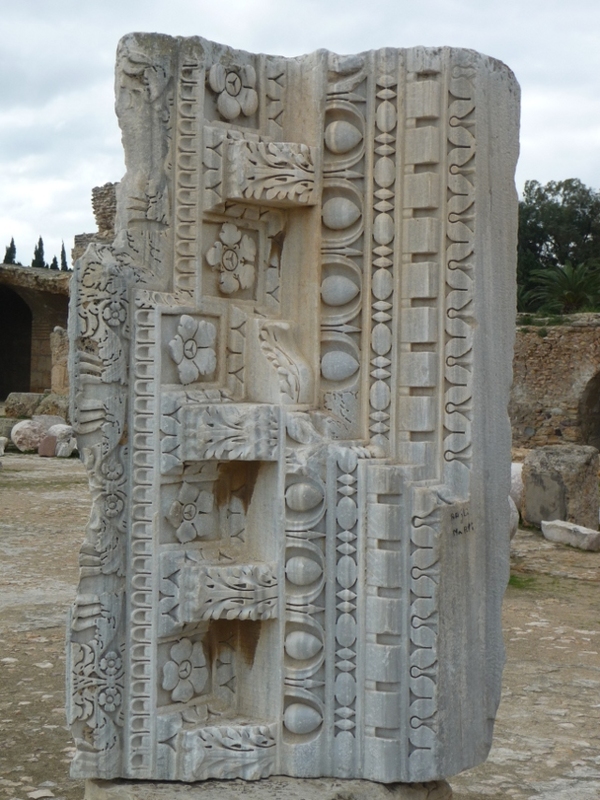 We couldn’t come to Tunis and not do the sites of Carthage though, but we were prepared for disappointment. 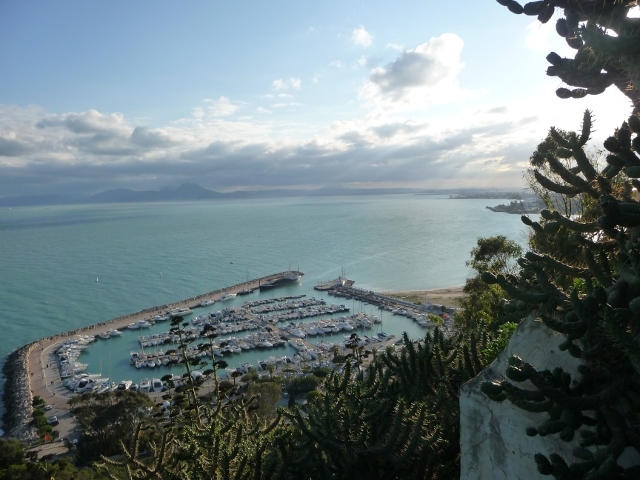 The sites are spread out among the rather select suburbs on the shores of the Gulf of Tunis and are served by several stations on a suburban train line that runs from Tunis Gare Marine (TGM line). The train chugs along the causeway that runs across Lake Tunis to this stretch of coastline calling at many small stations along the way. Children played their going to school game of jumping on the train at the last minute through doors held open by their pals, or they held on to the handles on the outside. Obviously a lot of fun. Our first stop was the Tophet, an ancient Carthaginian burial place said to be the location for animal and child sacrifice ceremonies. 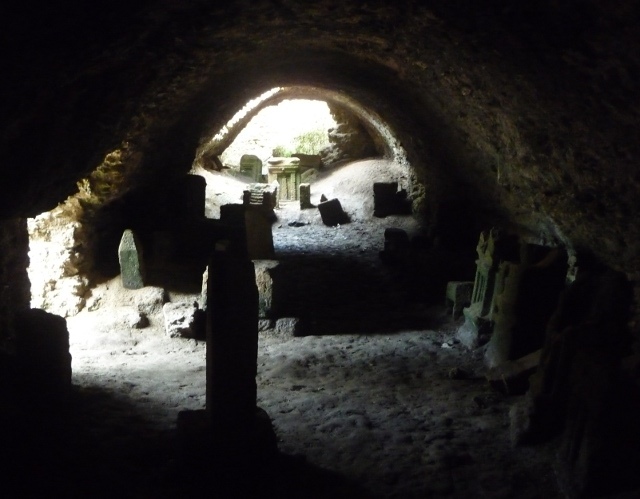 It has the air of an ancient graveyard with carved stones and intriguing passages, nooks and crannies. Here we bought our ‘global’ ticket which covers most of the sites, although we didn’t expect to have time or energy to do them all. From the Tophet it was a short walk down to what was the Punic port, but is now a peaceful stretch of water leading out to sea and surrounded by modern houses. A fascinating model has been left by one of the archaeological teams showing the grandeur that once existed here. The most notable remains are of one of the slipways used to launch ships. Otherwise it’s just a jumble of stones remaining with a rough outline of what was. We then found the Paleo Christian museum with its Vandal and Byzantine exhibits and then headed up to Byrsa hill through some very nice streets. At the top of the hill there is a 19th century French catholic cathedral – separate entrance fee – we didn’t bother! Beside it though, was the impressive Carthage archaeological museum with a garden of sculpture with magnificent views across to the city centre and out across the Gulf. Lower on the hill below the garden was extensive ruins of this part of Carthage – lots of walls remaining. By now we’d bypassed a few stations on the TGM line and went downhill towards the shore again in search of the Baths of Antonine – passing several embassy buildings on the way. We called in at a small German excavation of a residential area called Magon Quarter. This would be one to miss in favour of the other sites. Now we were only a couple of blocks from the Baths site and rather hungry. At the beginning of the day, we’d seen lots of food stalls and cafés. Now when we really needed one, it was just huge residences. No matter, we intended the Baths to be our last stop and one we could cover quickly. It was quite a large site and we started at the top, seeing various remains of buildings, and worked our way down towards the sea. 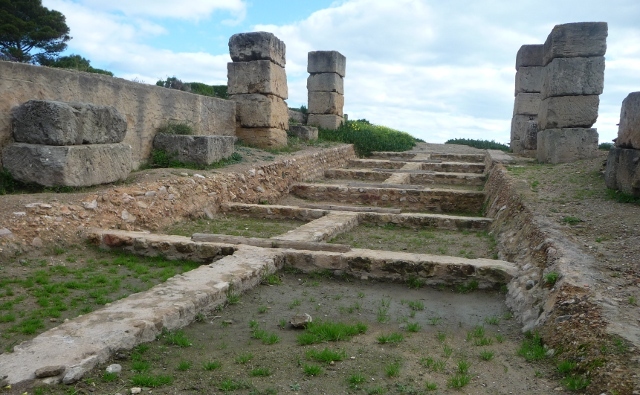 The ruins of the Baths were incredible – a real audible ‘wow’ from both of us when we caught sight of them. There’s so much there, you could really start to visualise them as they had been, helped by models and diagrams. Only one pillar has been put in place to indicate how high they were. They would have been absolutely spectacular and what was there was the remains of the below ground passages which would have contained the service areas. This is definitely the one site of Carthage not to miss. The place had quite a few armed guards wandering around, but then the president lives next door. We staved off our hunger pangs with some hugely over priced crisps and drinks, all that was available. As it was only a few blocks away we decided it would be a shame to miss the Roman villa. Again expecting a few piles of stones, we were pleasantly surprised to find extensive ruins with some mosaics and reconstructions, again on a bit of a hill so with wonderful views over the President’s palace and all its red flags. The call to prayer echoed out from the nearby mosque. 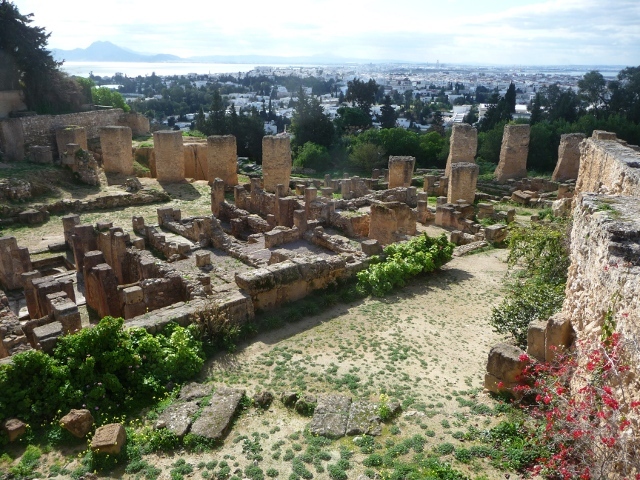 We were far from disappointed with our day exploring the remains of Carthage and only missed a couple of sites, but then we have seen quite a lot of Roman theatres in recent months. Very tired by now after a lot of walking and peering, we almost decided to head back to town, but thought it would be fun to just pay a quick visit to another outlying suburban town – Sidi Bou Said. We jumped back on the train and two stops later we were at this idyllic small town. 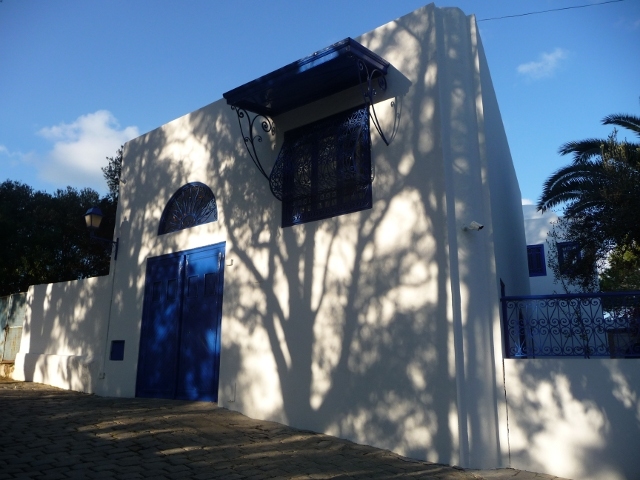 The sun was in its last hour or so and casting a rosy golden glow on the typical white washed houses with their Tunisian blue doors. There’s even a bye-law here to ensure that no one uses any other colours, and every corner had a photogenic sight. It’s obviously a very sought after select place to live which could so easily be spoiled with tourist tat. There is some of that, but luckily not too much. It is built on a hill and had the best views of the Gulf of the day – the end of the town overlooking the marina below. On our wander back down the narrow cobbled streets we spotted an old family residence that was open as a museum. We couldn’t resist the chance to see inside. 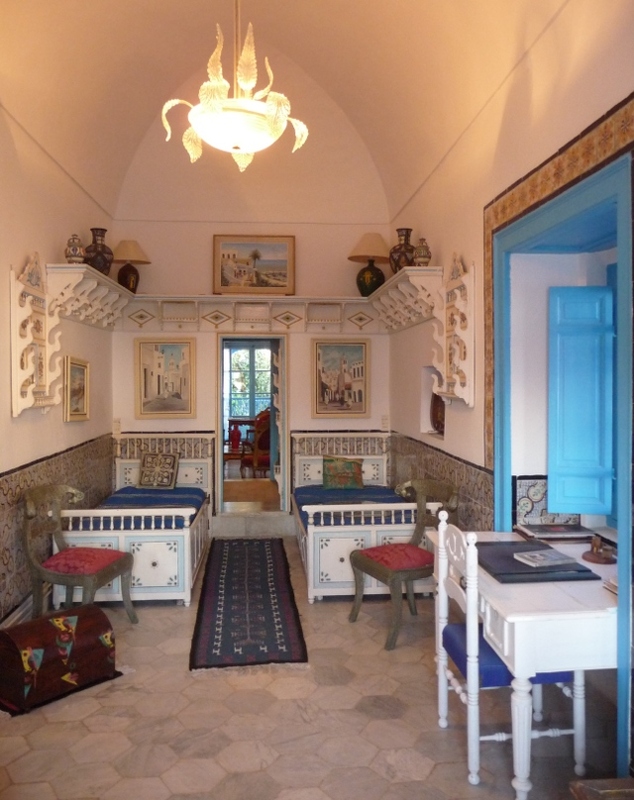 It was a wonderful place, built in the 18th century and still owned by the family. 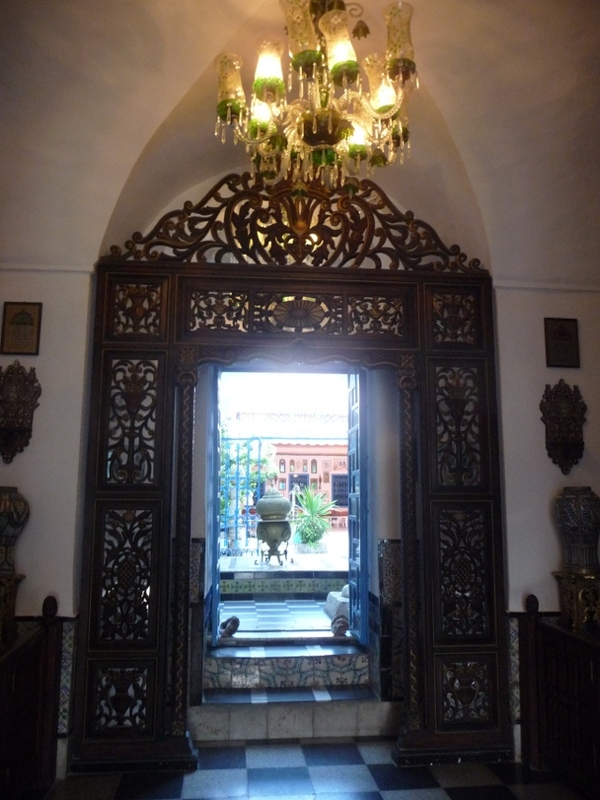 Tiling and ornate furnishings abounded, and views through doorways into the courtyards and beyond with decorative windows leading the imagination on. I would have been happy to move in tomorrow. Back into town at the end of the day on a crowded train, we felt like commuters for a brief interlude. We had worked hard today, but not in the office thank goodness. I do admire your enterprise intraversing Carthage under your own steam. I did a similar route on my trip 2 1/2 years ago but looked after by our on-board experts. I am glad you found the punic slipway, a really impressive piece of archeology. I wonder who is occupying the Royal Palace now. So I did enjoy a revisit through your eyes. WJM Turner did a couple of paintings of Carthage. One of Queen Dido supervising the construction of the city. (I do not believe that he ever actually went there!) Carthage is very topical for me at the moment as I am doing a talk to U3A on the Trojans in Carthage from Berlioz opera.